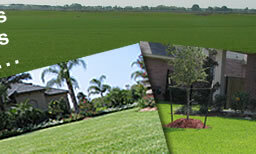 At Triangle Turf Company, our primary goal is to produce the highest quality turf grass available anywhere. The extra care we put into our grass to make it the best is something you will see every spring for years to come. When you are ready to buy your sod, ask your dealer if the turf came from Triangle Turf Company. This is quality you can trust. And remember, when it comes to the first in quality turf grass, the grass really is greener on our side of the fence. The grass is really greener on the Triangle Turf side of the fence! Do you want your neighbors to notice how your lawn stands out every spring? At Triangle Turf Company, we are dedicated to producing the high-quality St. Augustine grass, Bermuda grass, and Zoysia grass that will make you the envy of your neighbors and have them asking you for lawn care tips. Our quality turf grass sod is used in first-class installations in San Antonio, Austin, and throughout most of the rest of Texas. Call toll-free 1-800-753-5182 for more information and a free quote. When youʼre ready to begin a sod installation project, ask your sod dealer if his turfgrass comes from Triangle Turf. An affirmative answer means that your sod dealer focuses on quality work and it will assure you that youʼll have a lawn to be proud of for many years to come. Our grasses are grown to a standard of 95% purity or better! Please spend some time looking through our website. Weʼve provided information that we hope will help you choose the right grass for your location and installation. Triangle Turf Company specializes in growing sod that performs well in the demanding climates of San Antonio and Austin, so if youʼre looking for first-quality turf grass developed to thrive in your area of Texas, call us at 1-800-753-5182. We can deliver truckload quantities of sod (16 pallets) to your project site in San Antonio or Austin. For more information about St. Augustine grass sod, Bermuda grass sod, or Zoysia grass sod, please visit those information pages.